Here we are, flashing back to the Silly Sixties. 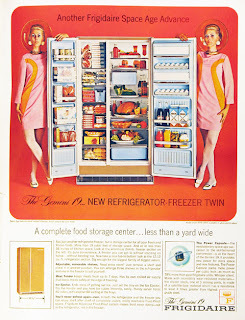 These towering twins [notice they're heads if not shoulders taller than the appliance] are meant to impress us with the grooviness of a side-by-side refrigerator-freezer dubbed the Gemini 19. The double allusion—to the space mission and the zodiac sign—is far-out indeed. Have you noticed how often these older ads for refrigerators feature something like Thanksgiving dinner inside? Also, your blast from the past is just in time for the Geminid meteor shower. Coincidence? It peaks Sunday night (12-13-09) with up to 100 meteors per hour. They'll be shooting out, like this Frigidaire, between Castor and Pollux, who never looked so stellar or so statuesque as these Geminis. Another perfect post. Thank you for the head's-up [ahem] about the Geminid meteors, evanjones; I shall consult the NYT sky chart to see what they say about viewing it in these parts. I have actually started to catalogue the contents of ad-reefers through the decades. It will be interesting to see how the foodstuffs change: from the basic ingredients for three squares through war-time 'rations' through the frozen-food era. Today, it seems that many adverts are art-directed by color alone, e.g., all orange packaging, or by filling the shelves with multiples of one item, e.g., a fridge holding only bottled water. The semiotics is strangely compelling. It sounds like a wonderful seminar topic. I hope you're serious. Saussure might have said that the signifier /refrigerator/ no longer has food as its primary sub-referent. Eco has already said, at least I assume he has, he's said almost everything, that refrigerators are now merely staging areas for comsumables. What will Leslie say? The wonderful (and horrible) thing about semiotics is that you are free to start almost anywhere — including kitchens — as long as you push toward a compelling conclusion. It sounds like you're half-way there.